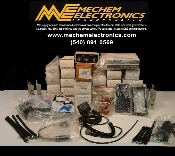 Mechem Electronics has over 30 years of experience in land mobile communications with clients worldwide. We are a contractor with federal, state, and local governments. We invite you to create an account with us if you like. Here you will find CISCO and general alarm equipment. Here you will find commercial and ham radio related equipment. Here you will find complete amplifier products by various manufacturers. For amplifier boards and related components, please see the parts lists by manufacturer. Mobile vehicle antenna's, permanent, and temporary mount styles. Here you will find P25 related base station equipment. Mid, VHF, UHF and 800-900 mHz. bands. Low power desk top to 350 and 400 watt upright. and full Diplexer- Duplexers and Isolators. Here you will find assorted contacts for electrical connectors. Here you will find Quartz Crystals, Oscillators and related items. Here you will find noise reduction headsets for shooter / radio communication. HF Shortwave 1.6 - 30 mHz transceivers, and receivers. Here you will find Incandescent, Neon pilot lamps and High Intensity projector bulbs. Here you will find High Security Housing Locks, Keys, Cylinders, Switches and Hardware, from Medeco etc. Here you will find VHF Marine radio and related equipment. Here you will find various microwave related items. Here you will find land mobile radio products. Here you will find Paging related infrastructure. Paging Transmitters, bridges, controllers, encoders, etc. Here you will find Portable Radio Products. Hand held, Packsets, portable repeaters, Portable base stations, APCOR, and related items. Here you will find various programming for Motorola radio equipment. Here you will find P. A. amplifiers and related sound equipment, non mobile. Here you will find radiation survey meters and counters. There are various instruments to cover Alpha, Beta, Gamma and Neutron emission. Here you will find Monitor receivers by various manufacturers. Here you will find control products for: DVP Positive Mode Tone Remote Control, standard Tone Remote, DC remote and local control products. Here you will find RFI and EMI power line filters, for mains and or individual chassis equipment. Here you will find Securenet Digitac Comparators, DVP SpectraTac receivers and DVP remote receiver Modems. Here you will find various Diodes, Rectifiers, Transistors and other related components. Here you will find equipment related to: Simulcast timing via GPS, VLF and Rubidium Atomic Oscillator's. Here you will find sirens and light bar, electronics controls, by various manufacturers. Here you will find analog Motorola Spectra Tac Comparators. Here you will find Motorola analog Spectra-Tac and other analog voting receivers. Here you will find equipment for parts. All have failed Q&A testing and/or are missing some components or boards. Specifics will be listed per item. Here you will find Bantam Patch Cords, Loop Back Cables and Plugs. Here you will find various Tone Reeds and Filters, for Paging, CTCSS and Tone Remote Control applications. Vibra Senders, VibraSponders, Permacode Active Filters, Versitone Filters etc. Bramco, GE, Motorola and RCA. Here you will find various types of Transformers. Power, Audio etc. Here you will find period specific radio accessories and electronics. Most items are reconditioned, clean and fully operational. A few items are OEM new! Perfect for the restoration of police, fire and EMS vehicles. Here you will find various wire for electrical and electonics. Here you will find various cable and harness assemblies. Here you will find White House Communications Agency and USSS radio equipment. Most carry the WHCA and unit inventory numbers, engraved in the transceiver body. Other agency equipment may be found here as well. The Motorola R2024D/HS allows the operator to easily test Securenet and analog communications equipment.